360° Sound: Two full-range drivers and dual passive radiators produce 20W stereo sound with enhanced bass, tight mids and crystal clear highs without distortion at any volume. Active Extra Bass: Make the bass more and volume louder by singel press the button. Enjoy the bass filling each corner of your room. Wireless Stereo Pairing: Connect 2 SoundBox Pro speakers via a single device for 360° stereo sound and double the volume. Beat-Driven Light Show: The wonderful light react and phase in time with the beat, included 7 color and 4 illumination patterns. Bluetooth 4.2 Technology: Bluetooth 4.2 connects stably from up to 66 feet away, and is compatible with all Bluetooth-enabled devices. 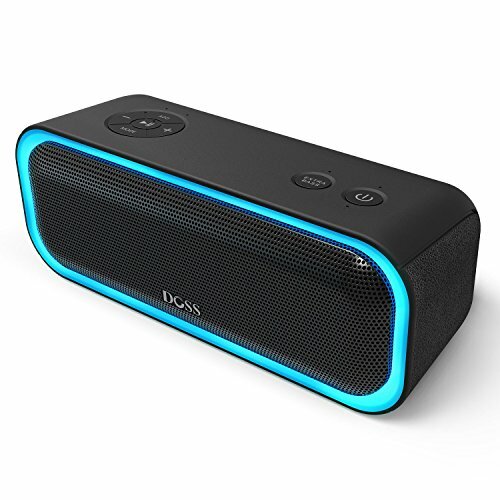 Moreover, this bluetooth speaker supports Aux-In, TF card, as well as the Echo Dot.